Port Sunlight Museum Tea Room is a welcoming and contemporary space located above the museum and gift shop on a mezzanine level with views of Port Sunlight. The Tea Room is the perfect place to relax and refresh with our wide selection of tasty locally scoured cakes, scones, sweet treat tray bakes and freshly brewed tea and coffee. We offer freshly made sandwiches, soups and daily changing specials. Enjoy a decant Afternoon in the heart of Port Sunlight, including fresh finger sandwiches, locally sourced cake, sweet treats and scones, cream and jam for just £12.50pp. 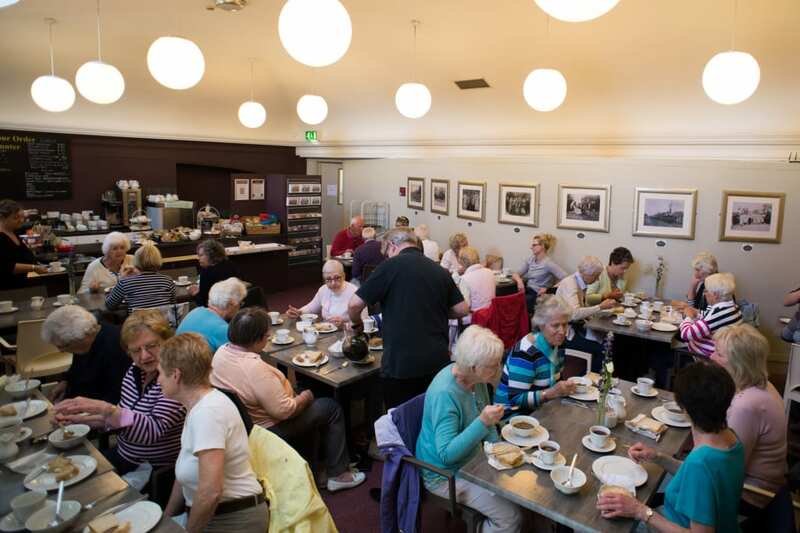 The Tea Room offers external catering options for venues throughout Port Sunlight Village, please contact m.jones@portsunlightvillage – 0151 644 4818 for catering packages. We offer a loyally card service, purchase 6 hot drinks and receive your 7th drink free! The Tea Room is open daily from 10am – 5pm, 7 days a week.